We’re expecting a daughter and want her name to be more timeless, and a little bit different, too. All of our siblings are married with kids, for a total of eleven niece and nephew names we can’t consider: Gabriella, Lily, Olivia, Piper, Sophie, and Zoey, plus Caleb, Cameron, Landon, Levi, and Wyatt. That’s okay, though, because, like I said, I think we’d like something different. The question is how different? My list is: Arden, Bellamy, Ingrid, Scout. His list is: Luna, Willow, Emery. The only name we sort of agree on is Presley. Except neither of us is an Elvis fan. We just like the sound. And yet I feel like it’s the kind of trendy name we’re trying to avoid. All of the others are okay – but it’s not like we each have a favorite or two we’re really fighting for. My only rule is no J names, even though I think Juniper is another name that I could love. Please read on for my reply, and leave your thoughtful suggestions in the comments. So I understand – and applaud – your attempts to find something just a little different for your daughter. And yet, a couple of things jump out at me. And in 1937? About 5.5% of all girls were named Mary. A name as common as Emma would come in around #12 by those standards. 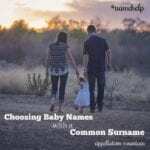 So even if you name your daughter Emma, odds are that she won’t feel quite the same way that you and your husband and siblings might. And yet, you do have some very popular names on your list. Luna and Willow rank in the current US Top 100. Emery is just outside the current Top 100. 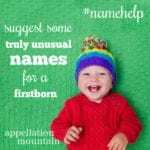 They’re not Top Ten at all, but it’s worth noting that you’ll probably meet other children with these names – or at least your co-worker will mention her cousin’s new daughter with the same name and you’ll overhear it on a television character and … you get the idea. Scout and Bellamy aren’t in the current US Top 1000. Arden and Ingrid are relatively uncommon. Presley is right around #200. That seems like a sweet spot, doesn’t it? Can you name your baby Presley if you’re not an Elvis fan? Most pop culture references fade. But Elvis? He’s the King. He died in 1977 – but he last scored a #1 hit in 2002. That’s the same year his music was featured in Disney’s Lilo and Stitch. There’s every reason to believe your Presley would be aware of the singer, as would her peers. That said, over 1500 girls were named Presley in 2017. No way were all of their parents superfans. And it’s been in heavy use for a decade. My guess is that a Presley born today would experience her name as perfectly mainstream, and not especially tied to the singer because it’s relatively popular. So there are upsides when a name catches on. You’ve probably looked at dozens of name lists, but let’s see if we can come up with a few fresh suggestions. Ingrid feels a little different, but Scout, Arden, and Emery are solidly surname-style names. So is Presley, of course. The strength of a surname name is that it can be very rare as a given name, but instantly familiar to all. First, how about some surnames nobody is really using, but would wear well? Bellamy – It’s just outside of the current Top 1000, but that Belle sound makes it feel familiar. Ellery – Emery always makes me think of Ellery. It shortens to Ellie, but the whole name feels accessible, too. Maguire – Maguire sounds distinctive and different, but it comes with built-in nickname Maggie. Romilly – Quite rare, but with history, and at least two easy nicknames: Milly and Romy. Blair – As tailored as Claire, but with a preppy, unisex sensibility. Also in this category: Sloane, but it’s nearly as popular as Presley. Haven – Okay, it’s a word name, not a surname. But it shares the same tailored style. Sutton – Rising quickly, thanks to appealing Broadway-turned-small-screen star Sutton Foster. Overall, I’m tempted to cheer for Maguire, maybe. Or maybe Romilly. But I think the right name might already be on your list: Presley. If you can overlook the Elvis connection, that is. Readers, over to to you. Would you use the name Presley? I think a surname name that is familiar from before this decade and below the top 100 would be a good target. I like Reese, Blair, and Ellery already mentioned. I’ll also suggest Greer, Lane, Darcy, and Paige. 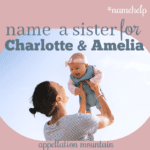 Or a non-surname with a tailored vibe would work — Tess or Meredith, or I like Cecily suggested by pps. Presley doesn’t really feel “timeless” to me, but if you like it, go with it. Scout, Willow, Emery, Luna and Arden are all names with a very contemporary feel – they are having a “moment” right now. 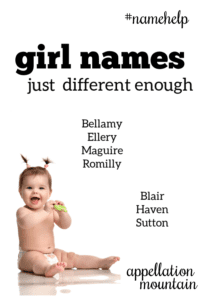 Surnames on girls are a current trend that may or may not last. If it doesn’t, those names will definitely give away their era! If timeless matters, it might not be such a good idea to go that route. French, German and medieval names are with a look, I think. They often have the non- frilly sound you seem to prefer while still being recognisable names that have never been trendy. Have loved this name for a while. It’s perfect. If you’re going for uncommon, don’t pick a name that shortens easily into a super common nickname such as Bella or Ellie. Emery is fairly rare, but sounds a whole lot like Emily and Emma, which are not. A name like Willow or Ingrid sounds a lot more distinctive than the masses of Lily and Addie. Kaedin may be rare, but not when you factor in Cayden, Kaidon, Ayden, Jayden, etc. Does Arden sound as special to you if she’ll share her classroom with Aiden? Think about whether you want the name to have a rare sound. If you don’t care either way, great! If you do care, go by sound more than an individual name’s ranking. Name suggestions: Brigid, Tamsin, Tatum, Eliza, Lilith, Maeve, Reese, Arbor. I have nieces named Chezney and Journey. Those seem like they might appeal to you. Recognizable but not common. I would also recommend Ramona. It feels ready for a comeback and Romy is a gorgeous nn. Arden + Ingrid = Astrid. Instead of Presley, how about Paisley? Instead of Bellamy or Emery, what about Cecily? Or Elodie? Briony? Ingrid is wonderful! It reminds me of Greta. Love Arden, too! (I know a fifth grade one who is so elegant and lady-like…) Do you like Kerensa? Or Irene? Luna brings to mind June (or Junia!). I know a few Willows; one has a sister named Magnolia (who goes by Maggie). Scout… Let’s see… Briar? Joan? Pearl? 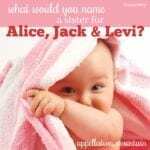 Have you given any thought to what you might name a second girl? Or a son? It *might* influence any decision you make now for this precious daughter. I think Ellery is perfect here. Other ideas for names with similar sounds are Merrin and Elodie. Heck, Elowen is like three of your names combined! Bellamy, Willow, Arden. It means elm tree, I believe. (I seem to be stuck on El- names!) Another uncommon natural name that may appeal to your hubby’s short spunky Luna and your elegant but tough Ingrid is Iris. On your lists, I like Bellamy best. I think the nice thing about Bellamy is she could have sisters in a vaguely unisex direction (among with Arden and Emery) or she could have sisters in a more distinctly feminine direction (Ingrid). I like Bellamy Willow and Arden Emery. I’m more a fan of Marlowe than Harlowe, but I see the appeal of both. I’m also a big fan of Sloane, and I love-love-love the name Holland on a girl. Or if you want something a little more feminine, maybe Greta instead of Ingrid, or Cecily, or Helene. It jumped into my mind while I was reading and I had to suggest it. I think it’s a similar sound to what is on your list. I have seen it talked about online more frequently, but it would still be in the sweet spot of unexpected/familiar enough. Scout, Blair, Romilly, Sutton and Bellamy. My granddaughter was going to be a Presley, but when my daughter would mention it, people’s first reaction was…. Elvis fan? A big no, so then, she was going to be a Paisley. Next she was going to be Hadley up until the day she was born. Now we have our sweet Hensley in the family. It is perfect for her. Not common, popular, or trendy; but familiar enough that people recognize it and can spell it without asking. Congratulations. I can’t wait to hear what you decide. You have Ingrid on your list, what about Astrid? I have a 17-year-old Astrid who is routinely the only one in whatever setting she’s in. It’s easy to spell and easy to say while still being unusual. I was going to suggest Astrid, too! I think it’s a beautiful name. I actually know an Astri, which I also love. I like Ellery and Presley quite a bit from these names. I definitely don’t think you need to be an Elvis fan to use the name Presley. Paisley is a name with a similar sound but a different feel. I also noticed they had several possible nature names with Willow, Luna, and Juniper, so I wondered if Poppy would be a possibility. I agree with Abby one could easily pull off the name Presley these days without any personal connections to Elvis. I think Harlowe is so perfect-surnamey, has the R sound of Arden and Ingrid, and the O sound of Willow. Great suggestion!